Natural Shampoo Products. Sounds simple enough, right? Ah, but truly good-for-your-health natural shampoo can be a super tricky, and often frustrating experience. Why? Well… for starters, most of us are used to commercial shampoos. Most commercial shampoos strip the scalp of its natural oils. The body, in its infinite wisdom, tries to balance itself back out by producing more oil. This of course translates into hair that gets really greasy really fast — a reason why most people feel like they need to wash their hair every day or two. Because they do. Because our shampoos are destroying our natural balance. The product we need to feel less greasy is making us… well, more greasy. And I love my recipes. They worked for my hair (particularly the second one as the first began to give me some scalp issues). And I’m not alone. I get lots of emails and comments from people happy with the recipes. But I also get comments and a million questions from people who are less than thrilled than the results. And that’s the problem with natural shampoos, whether it’s your own recipe or a product you buy at your health foods store: They work for some and not others. Why? Because our bodies are different. Our hair needs are different. Our water situation is different. There are a lot of factors that play into natural shampoo and their ability to give us nice, shiny hair and not a head full of greasy grossness. 2019 UPDATE: Since writing this post I’ve actually discovered Morrocco Method. Their products go WAY beyond my own strict requirement for natural shampoo and their Healthy Hair Starter Package SAVED my scalp (and got rid of my kid’s stubborn cradle cap.) I absolutely recommend their products. Plus, they are offering my readers 15% off their entire purchase with the coupon code TYB15. You can check out Morrocco Method’s Healthy Hair Starter Package here. Don’t forget to use code TYB15 at checkout for 15% off! Maybe you’ve tried going no ‘poo with no success. Maybe you tried a natural shampoo recipe and didn’t like the results. And maybe you are just really too busy or intimidated to even think about making your own natural shampoo. That’s okay. I get it. 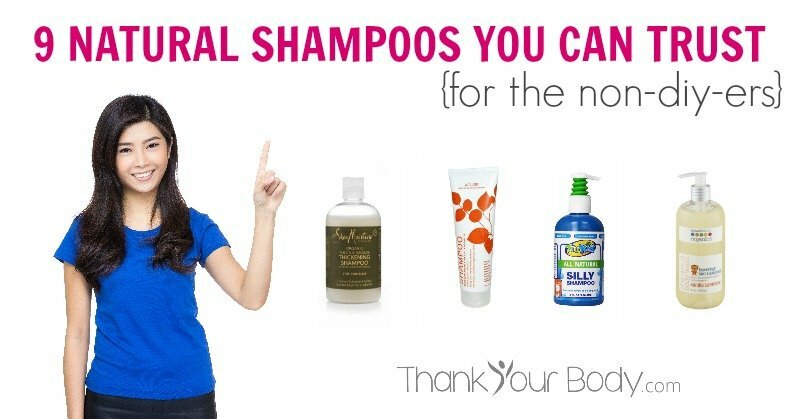 That’s why I’m giving you these 9 natural shampoo options for the non-diy-ers. Again, I can’t say each of these natural shampoo product will work for everyone, but I am providing products with some specific qualifications to hopefully help you make your way through the never-ending pool of natural shampoo options. Are found online because nothing is worse than getting a recommendation for an awesome natural shampoo that really works only to spend a lifetime trying to find it. They have a lot and mostly good ratings and reviews from actual users. I find reading through the reviews is helpful. Not everyone loves the products, but usually you can find people with similar situations to your own to feel more confident buying the natural shampoo. They are more economical than other natural shampoos. Don’t get me wrong, you’ll probably spend more than the buck or two you’d spend on cheap commercial shampoos. But I’ve tried to find as many natural shampoos that won’t break the bank, or that are at least less than the really freakishly expensive natural shampoos. It meets my high standards for natural ingredients and has worked better than my own DIY shampoo recipe. There you go! I hope this helps you in your quest for safer, more natural hair care. Don’t forget to check out my ultimate guide to natural hair care here.